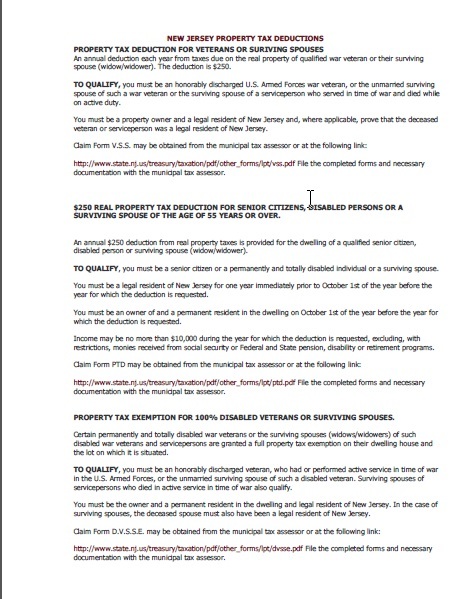 The Division of Taxation has begun mailing applications for the 2015 property tax reimbursement (Senior Freeze) to senior citizens and disabled residents who may be eligible for the program. The deadline for filing the applications is June 1, 2016. The Property Tax Reimbursement (Senior Freeze) Program, now in its 18th year, reimburses qualified applicants for the property tax increases they incur each year. Applicants must continue to meet all the income eligibility and residency requirements and must file an application each year to receive the reimbursement. Cooperates with the local Tax Assessor, the County Board of Taxation and other financial authorities. Responsible to receive payments of taxes and account for them. Reporting periodically activities in order to keep municipal governing officials and citizens aware of the state of the municipal finances. Responsible for the initiating and following the procedures for the enforcement of timely payment of taxes by taxpayers.